Bass Harbor, Maine: The founder of Morris Yachts, Thomas D.C Morris, crossed over the bar on Sunday, December 7, 2008 at 1830. He died at home in Southwest Harbor, Maine, surrounded by his loving family. Morris had been diagnosed with cancer in the summer of 2007. 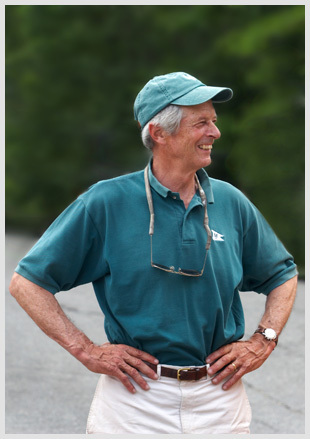 According to his obituary, from which the following is excerpted, Morris was born in Philadelphia in 1940 and developed an early passion for sailing on the family’s A-Class sloop, which his grandfather had acquired in 1913. Five generations had sailed the A-Class (No, 7) before the Morris family donated the boat to Mystic Seaport in 1975. 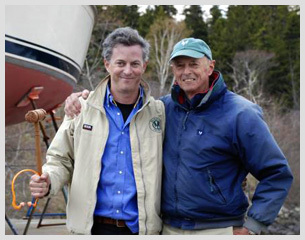 After an early career in business, Morris moved to Southwest Harbor, Maine, where he set up shop to finish fiberglass Friendship sloops built by Jarvis Newman. In 1972, he opened the doors of Morris Yachts in a boat shop he built behind the family home on High Road in Southwest Harbor. 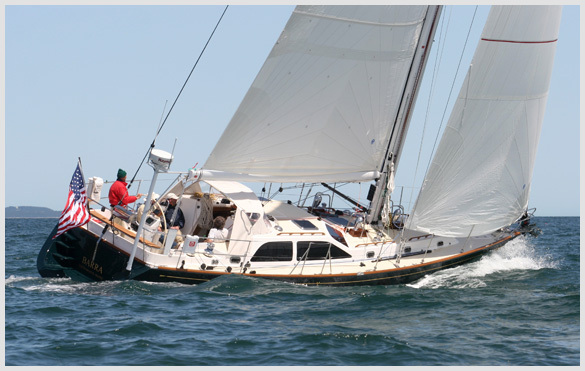 Production of the Frances 26, designed by Chuck Paine, began in 1974 and set the course for the company’s future. One of the company’s slogans, “Each one an Owner’s Original,” was backed up by Morris’s close involvement in the building process. As a result, he became close friends with many of those who bought a Morris yacht, and was wined and dined at their homes wherever he went. He enjoyed this immensely. One needed only to step aboard a Morris yacht to see Morris's many influences—no detail was too small for his involvement (the mark of a consummate sailor). His signatures include the placement of hand-holds where they should be; wide, clutter-free decks; and well-thought-out galleys. The only complaint one might have had with him as a sailor is that he was light on the provisioning. He would show up for a delivery with a sleeve of Saltine crackers and a can of herring and maybe another of corned beef hash. All Morris crew members knew to bring along extra rations when they did a delivery with him. 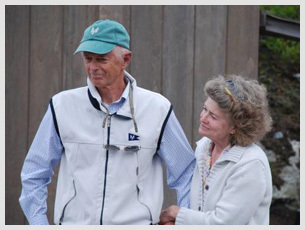 After his son Cuyler became president of the company, in 2001, Morris was able to spend more time sailing. In his new role as Ambassador-at-Large for the company, he sailed the Morris yacht S/VEscapade, a Morris 46, to Scotland, a trip which also happened to be his first transatlantic. As the company’s official delivery skipper he sailed the Morris 38, several M36s, and the M42 up and down the Atlantic seaboard to the various boat shows at which the company had a presence. Last year, he took delivery of his very own Morris M42 and cruised it down to Charleston, South Carolina last spring. Morris enjoyed strolling through the shop and talking with the crew; meeting and visiting with Morris yacht owners; and sailing anywhere, any time, under any conditions. “For those of us at Morris Yachts Tom leaves behind a legacy of the love of sailing, boatbuilding, and working hard for the simplicity of a job well done. He would take no greater pleasure than to know that the work he began so many years ago will continue in his absence,” said General Manager Will Ratcliff in a message to the crew.